Of historical collections of small mammals recovered from the Yushe Basin, fossil lagomorphs comprise a significant proportion because they are relatively large fossils and dentaries with teeth occur on the surfaces of exposures. 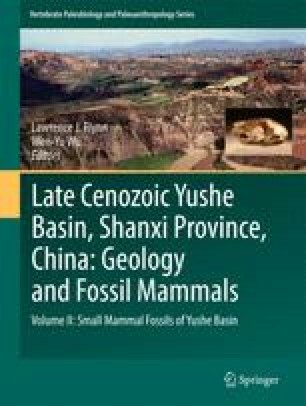 Key fossils recovered prior to 1940 from various parts of North China, including the Yushe Basin, formed the basis for early systematic studies of both ochotonids and leporids. Several Yushe Basin specimens were important in that early phase of research, and continue to be important in current revisions of Lagomorpha. This systematic treatment of the Yushe Lagomorpha embraces collections made by modern teams and classical collections of the Tianjin Natural History Museum, the American Museum of Natural History, and the Institute of Vertebrate Paleontology and Paleoanthropology. For Yushe our study recognizes an array of Ochotona (pikas) and species of the larger genus Ochotonoides . Leporids are diverse for the late Neogene deposits of Yushe Basin, and included the genera Alilepus, Hypolagus, Trischizolagus , and Sericolagus ; overlying Pleistocene loess yielded Lepus as well. These findings, including four new species, are important for lagomorph systematics, but also for the chronology of lagomorph evolution, because the Yushe sequence improves understanding of the relative ages of isolated Late Neogene deposits in China, and more broadly across Asia. Note: This chapter includes one or more new nomenclatural-taxonomic actions, registered in Zoobank, and for such purposes the official publication date is 2017. Our reviewers Alisa Winkler, Zhao-Qun Zhang and Yukimitsu Tomida devoted much effort to helping us to improve the manuscript and we thank them for their time. We also thank Miss Si H.-W. for helping us to produce the final illustrations. Flynn, L. J. (2011). Microtine rodents in the Frick Collection from Yushe Basin, Shanxi Province. Palaeontologia Electronica, 14.3.33A, 9 p. http://www.palaeo-electronica.org/toc.htm.